Scrapbooks Etc. magazine is a must have for the scrapbook enthusiast. 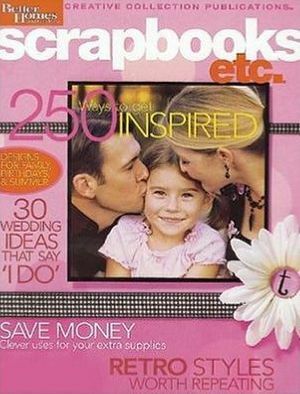 Scrapbooks, Etc magazine provides scrapbooking inspiration and instruction for all skill levels. Each issue of ScrapbooksEtc magazine is filled with everything you need to know to make magnificent memory pages. In Scrapbooks, Etc magazine you will find hot new techniques as well as scrapbooking basics and tools. Scrapbooks, Etc magazine also features in every issue helpful source lists and step-by-step instructions take you from start to finish and make each of your pages a masterpiece. We currently do not offer SCRAPBOOKS ETC MAGAZINE SUBSCRIPTIONS. You can purchase a SCRAPBOOKS ETC MAGAZINE SUBSCRIPTION at Amazon.